Sam O’Leary is a lifetime resident of Lakewood and graduate of the Lakewood City Schools. Sam grew up on Clarence Avenue, but moved to Clifton Boulevard when he returned to Lakewood after studying public policy at The George Washington University in Washington, D.C.
From early involvement in numerous political and civic campaigns, to serving on the Board of Zoning Appeals and the Tax Incentive Review Council, Sam has committed himself to knowing Lakewood, its residents, and the issues we face as a city. These experiences inform Sam’s vision of Lakewood as an historic and unique residential city complimented by vibrant commercial corridors that comprehensively serve the shopping, dining, and recreational needs of our citizens. To that end, Sam strives to develop and support partnerships between public, private, and non-profit stakeholders that turn eyesores into economic engines, while preserving our delicate balance of residential and commercial interests. Sam is an attorney at Matty, Henrikson & Greve, where he practices primarily in the area of public entity law. Click here for Council’s minutes and agendas. Click here to see City Council videos. LAKEWOOD, OH – City Council President Sam O’Leary will be hosting his first two town halls of the year on March 5th from 7:00PM-8:30PM in the Lakewood Library Main Branch multimedia room and Thursday, April 18th from 7:00PM- 8:30PM in the Lakewood Library- Madison Branch conference room. Councilman O’Leary invites all Lakewood citizens to come for meaningful discussion and to hear about the City’s progress moving forward. About Council President Sam O’Leary: Sam O’Leary is a lifetime resident of Lakewood and graduate of the Lakewood City Schools. Sam grew up on Clarence Avenue, but moved to Clifton Boulevard when he returned to Lakewood after studying public policy at The George Washington University in Washington, D.C.
Sam has been representing Ward 2 on Lakewood City Council since 2014 and was elected Council President by his colleagues in 2016 and 2018. The Heritage Advisory Board meets monthly and advises the City and the community on matters related to historic preservation. A detailed description of the Heritage Advisory Board and its duties is located in Chapter 1337 of the Lakewood Codified Ordinances. Two four-year terms are available effective January 1, 2019. The Planning Commission makes official reports and recommendations on proposed changes to the City’s Zoning Code, oversees changes to the use or development of land, and holds public hearings on the same. A detailed description of the Planning Commission is located in Article VII of the Third Amended Charter of the City of Lakewood. One six-year term is available beginning January 1, 2019. Planning Commission members should possess related expertise in the above areas and be available for up to 5 hours of service per month. The Board of Nuisance Abatement Appeals hears appeals from property owners whose properties have been designated as nuisances under Section 510.01 of the Codified Ordinances. The Board of Nuisance Abatement Appeals meets infrequently as-needed and performs a necessary due process function for residents. Additional information about these boards and commissions, including agendas and minutes, are located on the City’s website at: http://www.onelakewood.com/apply-register/boardscommissions/. Applicants are asked to email or deliver a cover letter and résumé for consideration to the Clerk of Council. Positions will remain open until filled. For more information, please contact Maureen Bach, Clerk of Council, at (216) 529-6054. Lakewood City Council President Sam O’Leary is seeking applicants for a two-year appointment to the Lakewood Animal Safety & Welfare Advisory Board effective January 1, 2019. The Animal Safety & Welfare Advisory Board is made up of 11 Lakewood residents who advise the City and the community on animal issues. Recently, the Board has performed outreach to the community on the new dog ordinance, organized a spay and neuter event, and provided support for the Spooky Pooch Parade. Applicants should be able to commit to one monthly meeting and additional sub-committee meetings and project work as-needed. This is an unpaid volunteer position. Additional information about the Animal Safety & Welfare Advisory Board including agendas and minutes, are located on the City’s website at: http://www.onelakewood.com/apply-register/boardscommissions/. Applicants are asked to email a cover letter and résumé for consideration to Council President Sam O’Leary at sam.oleary@lakewoodoh.net. Lakewood City Council is seeking a volunteer to fill a Board of Building Standards/Architectural Board of Review vacancy. The unexpired term ends December 31, 2019. This Board considers architectural proposals for commercial and residential properties, reviews applications for variances to the City’s Building Code, and reviews sign proposals. Council is also seeking a volunteer to fill a Lakewood Heritage Advisory Board vacancy. The term of this unexpired seat ends December 31, 2018. The Lakewood Heritage Advisory Board educates, informs and makes recommendations to City Officials and the community on matters related to historic preservation. Applicants must be residents of Lakewood, have a desire to serve their community in a volunteer capacity, and be able to contribute the number of hours necessary to adequately contribute to the particular board’s mission. Applicants are asked to send a cover letter and/or résumé, to Lakewood City Council, 12650 Detroit Avenue, Lakewood, Ohio 44107 or email those materials to mary.hagan@lakewoodoh.net. For more information, please contact Mary Hagan, Clerk of Council, at (216) 529-6053. Lakewood in partnership with Sandy Hook Promise, a national, nonprofit organization led by several family members whose loved ones were killed in the tragic mass shooting at Sandy Hook Elementary School is naming October 16 to 20, 2017 as Say Something Week. Say Something teaches students in Middle School and High School how to look for warning signs, signals and threats, especially in social media, from individuals who may want to hurt themselves or others and to Say Something to a trusted adult to get them help. The program is based on research conducted by Dr. Dewey Cornell and Dr. Reid Meloy, two leading national experts in threat assessment and intervention. The weeklong series of events includes Say Something training at Harding and Garfield middle schools. When it comes to violence, suicide and threats, most are known by at least one other individual BEFORE the incident takes place. In fact, 80% of school shooters told someone of their violent plan prior to the event. Additionally, 7 out of 10 people who complete suicide told someone of their plans or gave some type of warning or indication. Imagine how much tragedy could be averted if these individuals said something? Say Something Week raises awareness and educates students and the community through training, media events, advertising, public proclamations, contests and awards. Say Something Week reinforces the power young people have to prevent tragedies and Say Something to a trusted adult to protect a friend from hurting them self or others. The City of Lakewood and Sandy Hook Promise is asking schools, student clubs, parents and community leaders to visit www.sandyhookpromise.org/bringSaySomething to learn how to begin using Say Something in their schools, homes and community. City Council is forming a citizens committee to evaluate the future of the Winterhurst Ice Rink Facility. If you are interested in volunteering on this committee call Lakewood Clerk of Council Mary Hagan at 216-529-6053 or submit an email to mary.hagan@lakewoodoh.net. Experience as a skater, hockey player, coach or involvement in ice rink related activities/general athletic facilities management is a plus. Lakewood City Council is seeking a volunteer to fill a Board of Building Standards/Architectural Board of Review vacancy. The unexpired term ends December 31, 2019. Applicants must be residents of Lakewood, have a desire to serve their community in a volunteer capacity, and be able to contribute the number of hours necessary to adequately review plans coming before the Architectural Board of Review/Board of Building Standards. This Board considers architectural proposals for commercial and residential properties, reviews applications for variances to the City’s Building Code, and reviews sign proposals. Applicants are asked to send a cover letter and/or résumé, to Lakewood City Council, 12650 Detroit Avenue, Lakewood, Ohio 44107 or email those materials to mary.hagan@lakewoodoh.net. The submission deadline is 5 p.m. September 29, 2017. LAKEWOOD, October 17, 2016: During its Committee of the Whole meeting, Lakewood City Council members had an opportunity to tour the Cleveland Clinic’s Mobile Stroke Treatment Unit and discuss how Lakewood residents will benefit from new advances in stroke care. Council President Sam O’Leary invited the unit to City Hall following the completion of the contractual agreement to bring the unit to Lakewood. Within the next several days, following the completion of protocols and training among Cleveland Clinic officials and Lakewood dispatchers and paramedics, the unit will help first responders save lives in Lakewood. The unit c rew showed Council members the technology available for on-site stroke diagnosis and treatment, including a mobile CT scanner and a mobile lab that allows the crew to do lab tests on board. If appropriate, the crew will be able to administer tPA – a medication that can break up blood clots and give patients a better chance at survival and living without disabilities often associated with a stroke. Upon receiving treatment, patients are transported to the most appropriate hospital. Before arriving at Lakewood City Hall, the unit crew had just treated a stroke patient with tPA on board the unit as they transported him from his home in Euclid to the Cleveland Clinic’s main campus. “Stroke is the number one cause of serious long-term disability in the United States, and treating stroke patients faster both saves lives and reduces disability,” said Andrew Russman, D.O., Medical Director of the Mobile Stroke Treatment Unit at Cleveland Clinic. “In the fight against stroke, the mobile stroke treatment unit is at the forefront of our emergency response capability. We have seen tremendous success for patients in the last two years with the mobile stroke treatment unit, and we look forward to bringing mobile stroke care to the doorsteps of the residents of the City of Lakewood.” Since Cleveland Clinic began its Mobile Stroke Treatment Unit program two years ago, more than 2,500 patients have been serviced by the unit crew. Of those, 91 have received tPA on site. You can watch a video to better understand how the Mobile Stroke Unit works and who benefits most. As the legislative arm of Lakewood City government, the chief function of City Council is the making of laws. While serving as the city’s lawmaking body, Council also monitors the operation and performance of the city budget. In addition, Council members serve as their constituents’ links to their local government. When a constituent has a question or concern with city policy or services, they are encouraged to contact their ward Council representative, or any Council at Large member. The legislative powers of the City, except as limited by the Charter, are vested in City Council. As the legislative body, Council makes and passes the laws governing the city. The legislative process comprises a number of steps, and includes committee action during which the most intense consideration is given to the proposed measures; this is also the time when citizens are given their opportunity to be heard. Each piece of legislation is referred to the committee that has jurisdiction over the area affected by the measure. Council members serve on at least two committees and all serve on the Committee of the Whole. Most committee meetings are held in the Court’s jury room or in the Council Chambers. Legislation is proposed by Council members, the Mayor or administration or by citizen initiative (petition). Under Article III, Section 8 of the City Charter, “each proposed ordinance shall be introduced in written or printed form and shall not contain more than one subject, which shall be clearly stated in the title,” with the exception of general appropriation ordinances. Proposed legislation is introduced to Council during a regularly scheduled public Council meeting and referred to the appropriate committee. A committee hearing is held, during which Council members consider the proposed legislation and public commentary. If necessary, the proposed legislation is amended. The committee votes on the legislation. If passed, the legislation is sent to full Council for discussion and a final vote. If passed, the legislation is sent to the Mayor. The Mayor signs the legislation. The proposed legislation becomes a local law. If the Mayor disapproves and vetoes it, the legislation comes back to Council with the Mayor’s written objections. Council can override the Mayor’s veto by a two-thirds vote. If the Mayor does not sign or veto the legislation within ten days after receiving it from Council, it is considered approved. This estimate itemizes the expense of conducting each department, comparisons with corresponding items of expenditures for the last two complete fiscal years, reasons for proposed increases or decreases compared with the current fiscal year, departmental schedules, payroll increases, anticipated revenue from taxes and other sources, debt interest and bond retirement funds, long-term financial obligations of the City and “such other information as may be required by Council.” Upon receipt of the estimate, Council initiates the budget approval process to monitor the operation and performance of the City’s budget, establish priorities and allocate resources for the year, and thereafter pass temporary or permanent appropriation ordinances. The Clerk of Council, appointed by City Council, maintains records of proceedings of City Council and records of ordinances and resolutions adopted by City Council. The Clerk’s office is the designated repository for all official documents of the City. As official parliamentarian of the City Council, the Clerk conducts council meeting and publishes the minutes to reflect all legislative action. The Clerk also provides notice of regular and special meetings of City Council, directs the activities and programs of the office, provides reference and research services regarding enacted or pending legislation and other Council documents and performs all duties outlined in the 2nd Amended Charter or as directed by City Council. 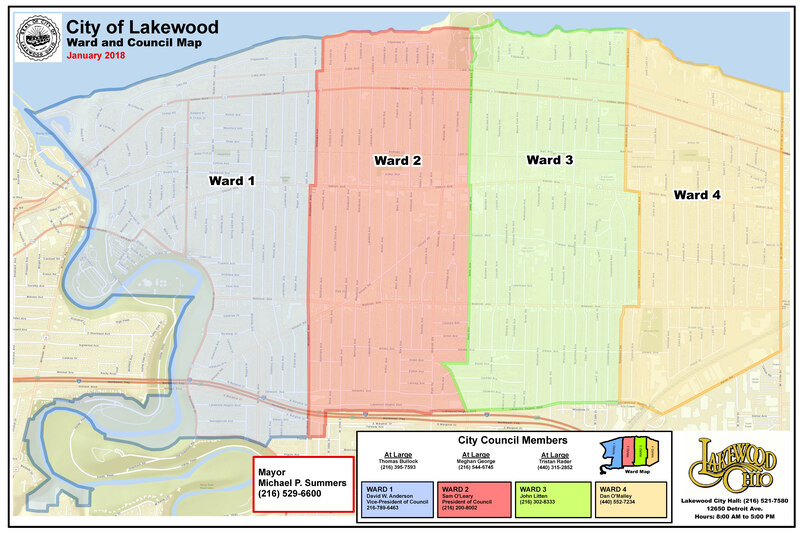 Q: When does Lakewood City Council meet? A: At seven-thirty (7:30) p.m. on the first and third Monday of every month, or, if such Monday falls on a Holiday, on the Tuesday following. Only Special Council Meetings or committee meetings are held in the month of August. All regular City Council meetings are held in the Council Chambers at City Hall. In addition, there are seven (7) standing committees of Council that meet at the discretion of the appointed chair. Q: How long is a Council Member’s term? Are they full time? How much do they get paid? A: Each council member serves a four-year term. They work part-time. In 2014, Council voted to increase their salary from $7,000 to $13,000. This was the first increase in 32 years. This increase is phased in: Four (4) Ward Council members began receiving the new salary in 2016. Three (3) At-Large council members began receiving the new salary in 2018. Council members also have the option to receive full health care benefits through the city.